This is a B&H exclusive Lowel Tota-Omni Two-Light Kit, which includes two of Lowel's most popular light fixtures: the compact Tota-Light, and the versatile Omni-Light. B&H has included economical yet sturdy light stands, a barndoor set, umbrellas, and a large soft carrying case, all at a great price. Note: Bulbs are not included and must be ordered separately. When fitted with an EMD 750W bulb, the Tota-Light will emit a beam of 41 footcandles with the barndoors at normal position, and 34 footcandles with the barndoors at 180° position, from a distance of 10' (3 m). When fitted with an FTK 500W bulb and standard reflector, the Omni-Light will emit a beam of 75 footcandles at full flood and 475 footcandles at full spot, from a distance of 10' (3 m). The wide focusing range of the Lowel Omni-Light makes it a flexible key or backlight. Add diffusion or an umbrella, and it's a soft fill source. Swap the power cord and lamp and it becomes a battery powered, handheld light. Available with a host of accessories and built for heavy duty long life, the popular Omni is the perfect companion to the Tota. When fitted with an FTK 500 watt bulb (available separately), this fixture will emit a beam of 75 footcandles at full flood and 475 footcandles at full spot from a distance of 10' (3m). Other bulbs and plug adapters are available. Double parabolic peened reflector provides non-crossover beam for maximum efficiency and gel life. Allows the Omni-light to be adjusted easily, can be hand-held, and folds for storage. Has a focus range of 6:1 with #1 reflector and FTK Lamp. Uses 500, 420, and 300W at 120V. Other bulbs are available for 230, 240 VAC, and 12-30 VDC. Barndoors, Scrims, Dirchroic Filter, Snoots, Gel Frame, and Flag are all available separately. 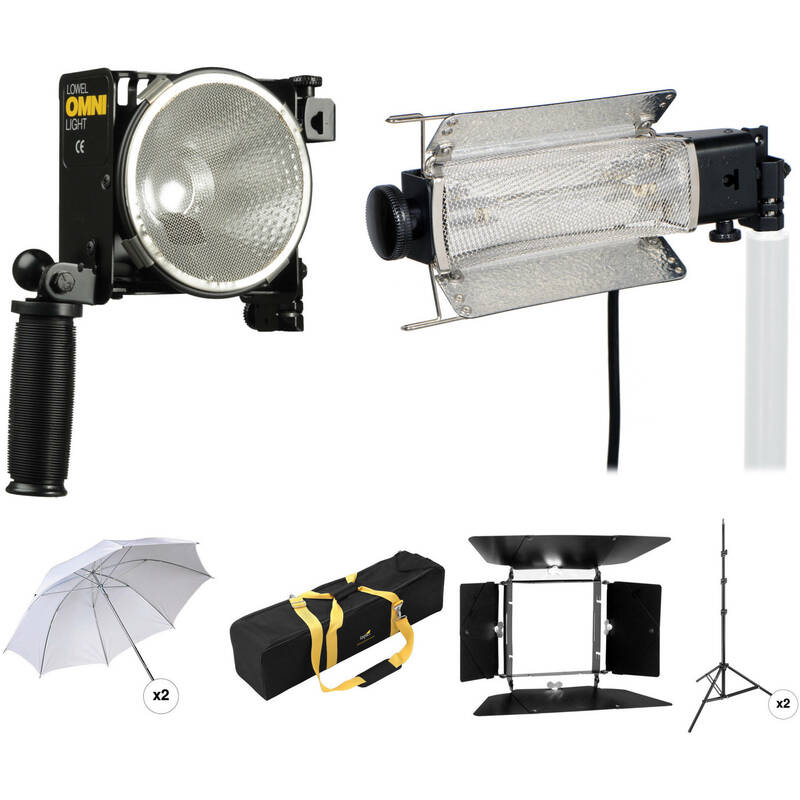 Compact, rugged, and versatile, the broad throw Lowel Tota-light can be used with an umbrella or gel frame, or with diffusion as a soft key, fill, or backlight. With its adjustable reflectors, it can be a smooth and even background light, or point it toward the ceiling to raise the ambient (base) light level of a room. Tota is also widely used for photographic copy work. When fitted with an EMD 750W / 120V bulb (available separately), the Tota-Light will emit a beam of 41 footcandles with the barndoors at normal position, and 34 footcandles with the barndoors at 180° position, from a distance of 10' (3m). The Tota-Light is multi-voltage capable, and a choice of bulbs and plug adapters are available. Its aperture measures only 4.5 x 11" (11.4 x 29.9 cm). Can be rotated a full 360° with the large, stay-cool, plastic adjustment knob. It uses bulbs from 750 to 300W / 120V. It uses 800W bulbs for 220V use. Adjustable reflecting doors can illuminate four walls evenly from a corner or compensate for light fall-off from above or below. This size is perfect for a 1 person head shot, or a 3x4 ft product setup. The Impact Light Kit Bag #3 (Black) is a soft padded case designed to transport and protect a 2 monolight lighting kit. It has space to hold 2 monolights with reflectors, cables, umbrellas and light stands. It is carried by 2 overlapping carrying handles or the included shoulder strap. The Lowel Complete 4-Leaf Barndoor Set for the Omni Light includes a frame with two rectangular and two triangular leaves which are all expandable. It rotates 360° and holds up to two Lowel Omni accessories. Each barndoor leaf has a sub-leaf that extends, which adds to its light-shaping ability. This aluminum Impact Air-Cushioned Light Stand rises to a height of 8' and folds down to 29.6". The stand has sure-twist section locks and 4 sections and will support up to 8 lb. If you forget to tighten any section with your light mounted, the light slowly descends, thanks to the air-cushioned action. This useful feature saves equipment and fingers from harm during busy photo sessions. Protects equipment from impact damage. Will fit easily into most location cases. Eases positioning of heavy lights. 2 x Umbrella - Tota-Brella (Special/White) - 27"
Box Dimensions (LxWxH) 8.0 x 6.5 x 6.5"
Box Dimensions (LxWxH) 12.3 x 8.45 x 4.35"
Box Dimensions (LxWxH) 20.75 x 1.85 x 1.65"
Box Dimensions (LxWxH) 52.0 x 8.0 x 8.0"
Box Dimensions (LxWxH) 6.9 x 6.85 x 4.55"
Box Dimensions (LxWxH) 29.75 x 3.2 x 3.15"